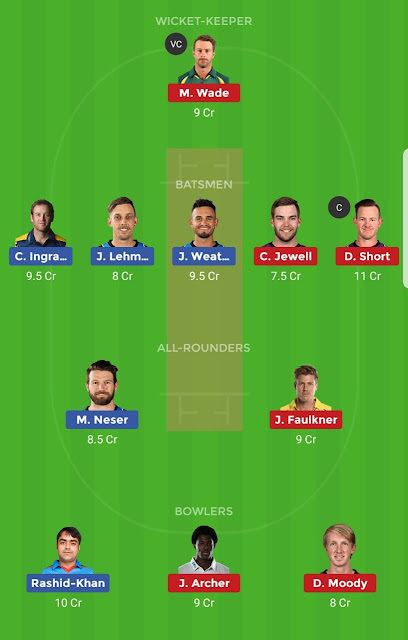 PREDICTED LINEUPNEP: Gyanendra Malla, Binod Bhandari/P Airee, Paras Khadka, Dipendra Singh Airee, Sandeep Jora, R Paudal,Sompal Kami, KC Karan, B Regmi, Sandeep Lamichhane, Avinash Bohra/Lalit Rajbanshi/A Seikh UAE: Ashfaq Ahmed, CP Rizwan, G Shabber, Shaiman Anwar, M Usman, M Boota, M Naveed, Sultan Ahmad, Imran Haider, Amir Hayat, Zahoor Khan UAE vs NEPAL Team*Invest Less Best of Luck 🤞. 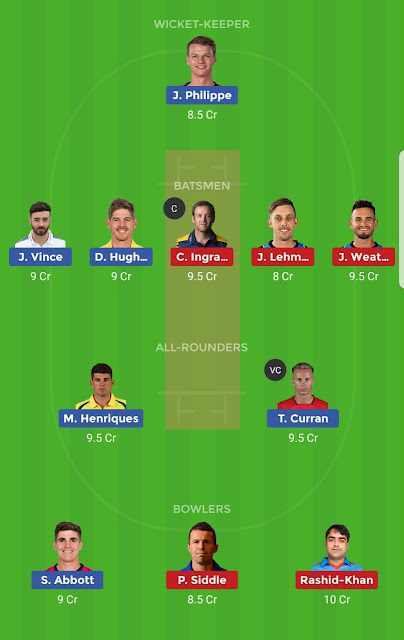 Pacer Qazi Onik can replace Mahmudul Hasan in the playing XI.Evin Lewis got injured in second last match and also did not came to bat in the last match. Liam Dawson can replace him if he is unfit. AUS vs SL, Second Test, Sri Lanka tour of Australia, 2019🏟️Manuka Oval, Canberra 1st Test Match at this ground 🕛1st to 5th February 2019, 5:00 AM IST📰Team NEWS:*Suranga Lakmalis injured, so final call on his playing will be taken before match starts. 🕐 31st January, 02:00 PMTeam NEWS:Adelaide Strikers announced 13-player squad for the match with two changes. Peter Siddle and Matthew Short are replaced by Wes Agar and Harry Nielsen in the squad.Hobart Hurricanes have also declared 13-men squad for the match with one change. Riley Meredith is recovering from illness and Thomas Rogers replaces him in the squad. 📰TEAM NEWS:Aliss Islam is injured and is unlikely to feature tomorrow. Ghd Dasun Shanaka is playing with Sri Lanka A team and will not play in BPL. R Frylinck if fit will return in the playing XI replacing Najibullah Zadran. 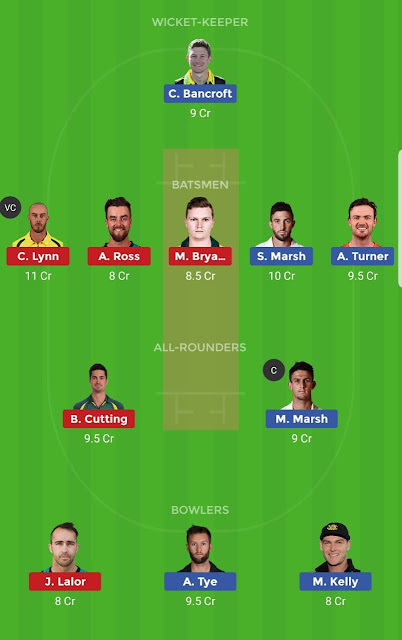 SQUAD:DHD: Shakib Al Hasan (c), Sunil Narine, Kieron Pollard, Andre Russell, Hazratullah Zazai, Rubel Hossain, Nurul Hasan, Rony Talukdar, Shuvagata Hom, Andrew Birch, Ian Bell, Qazi Onik, Mizanur Rahman, Asif Hasan, Shahadat Hossain, Mohammad Naim, Mohor Sheikh, Heino Kuhn. MLR vs SDT Grand League Team | Melbourne Renegades vs Sydney Thunder Big Bash Preview & Match Prediction🏟️ Docklands Stadium, Melbourne. 🕧 January 30 at 1:45 PM 📰Team NEWS: Melbourne Renegades: Jack Wildermuth and Jon Holland return to the squad. Cameron White and Joe Mennie miss out. Sydney Thunder: 19-year-old wicket-keeper Baxter Holt is in line debut. Jono Cook and Arjun Nair are among other additions. Matt Gilkes and Sam Rainbird miss out. 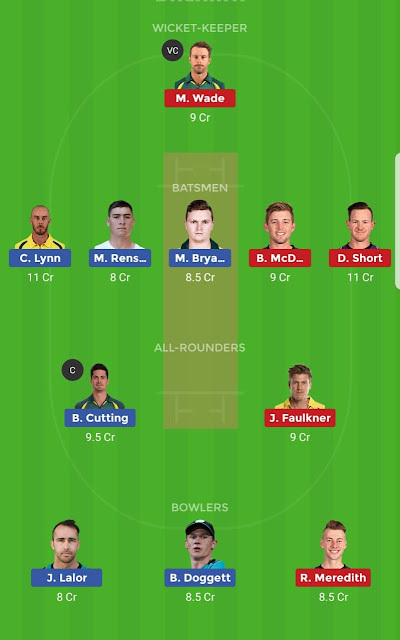 Tom Cooper, Dan Christian, Mohammad Nabi, Cameron Boyce, Kane Richardson, Sam Harper, Mackenzie Harvey, Aaron Finch (c), Harry Gurney, Beau Webster, Jon Holland, Chris Tremain, Jack Wildermuth. If New Zealand try to replicate India's plan of strangling the batsmen with spin, they can bring in Anna Peterson, who can contribute with the bat as well. Lauren Down hasn't made most of the limited opportunities she's gotten thus farBarring injury, India are likely to go with the same XI.